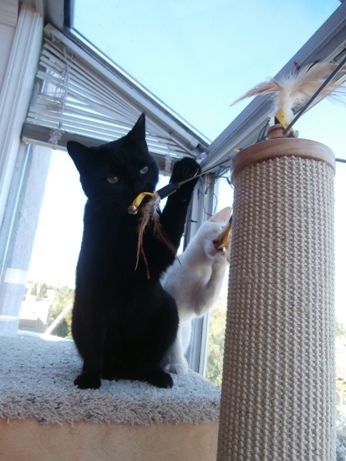 Our cats Freya and Sage and foster kitten Helix enjoy playing with the flying prey simulator. This feature provides hours of entertainment. Alleviating boredom and frustration: Indoor cats can become bored and irritable if unable to engage in activities that are natural for their species, and this can lead to behavioural problems or depression. The Cat Power Tower alleviates boredom and frustration by providing opportunities to do all the things that cats would do outdoors. The rotating feather carousel provides hours of entertainment as cats climb the “tree” and work to capture the moving “birds.” You can also place a few treats in the hunting holes along with various cat toys to make the ground hunting simulation realistic and rewarding. 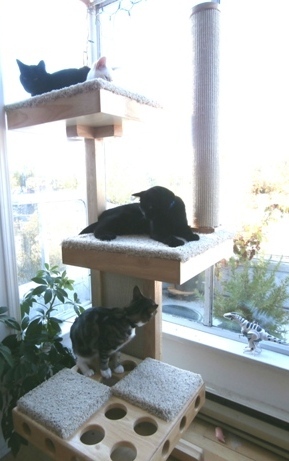 Maintaining health and fitness: The Cat Power Tower encourages climbing, jumping, and pouncing, all of which help to maintain a cat’s cardio fitness, muscle strength, and overall health. Encouraging activity is particularly important for older cats because it reduces the risk of many health problems associated with aging. 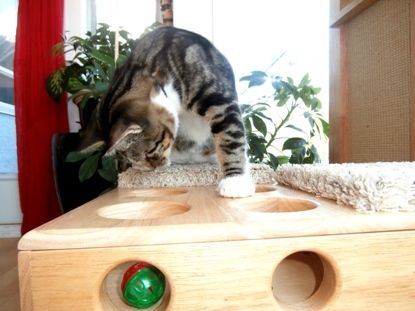 Sage hunts cat toys on the ground hunting activity platform. Aiding weight loss in obese cats: Indoor cats often overeat out of boredom, which can lead to weight gain. In addition to encouraging physical play, the Cat Power Tower can be used to aid weight loss by making fat cats work for their food as they would in the wild. Place some low-carbohydrate, high-protein kibbles in the hunting holes and the cat will expend more calories obtaining the food than he’ll consume while eating it; plus, he’ll have far more fun than he would gobbling it out of a dish. 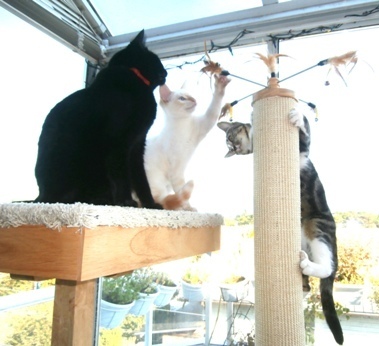 Encouraging cats to scratch something other than furniture or carpets: Our cats tended to go for the dining room chairs rather than their scratch post, but the Cat Power Tower, with its multiple large scratching surfaces, has proven to be far more appealing. This product is a real furniture saver! Helix practices his climbing while Sage captures a “bird” and Freya watches. An additional benefit of the Cat Power Tower is that it’s not hideous, unlike the majority of cat climbing products on the market. Made of attractive wood and higher-end carpeting in subtle, natural shades, the Cat Power Tower is great for people who care about the happiness of their pets but don’t want to put something ugly in their livingrooms. The Cat Power Tower base is made from rubberwood, a quality hardwood (it has a hardness rating similar to that of cherry wood). 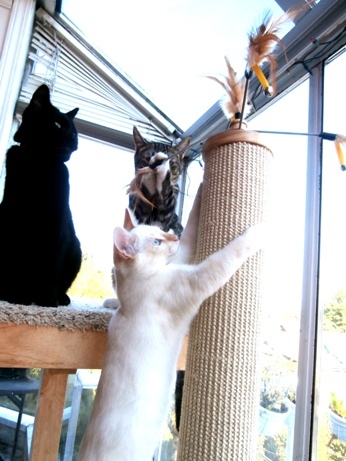 Durable rubber-backed sisal floor covering, used for the scratching surfaces, is very appealing to cats. The lounging surfaces are covered with Everstrand carpet, which is not only far higher quality than the carpeting typically used for cat trees but also made from 100% recycled materials. All of the materials used in this product are environmentally friendly. The Cat Power Tower has received many awards and positive reviews, as well as a 5-star Amazon rating, which indicates that others have liked the product as much as we have. If you’re interested in learning more about the Cat Power Tower, visit CatPowerTower.com. For more cat product reviews, visit the main Pet Products page. For a full list of articles, see the main Cats page. 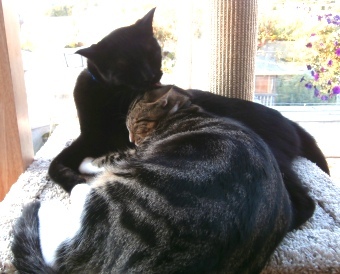 Smokey grooms Sage – the wide Cat Tower Power platform easily accommodates two cats. 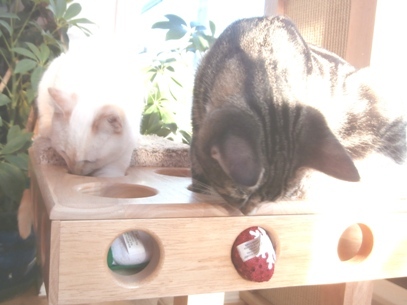 Sage and Helix hunt for kibble treats among the cat toys. Freya and Helix celebrate a successful hunt. Freya, Helix, and Smokey rest after a hard day of playing, while Sage carries on with his activities. Smokey is a large cat, so he appreciates having the wide, comfortable platform for relaxing.